I was a human Pina Colada on Sunday… I was covered in coconut oil but sadly I didn’t smell too much like coconut! Weird. I’ve heard and read so many wonderful things and now that stores are realizing there is a craze for it, the prices for some coconut oil is crazy. Don’t be caught out. I was about to buy a small bottle (sure it was beautifully packaged) for R92 but decided against it. 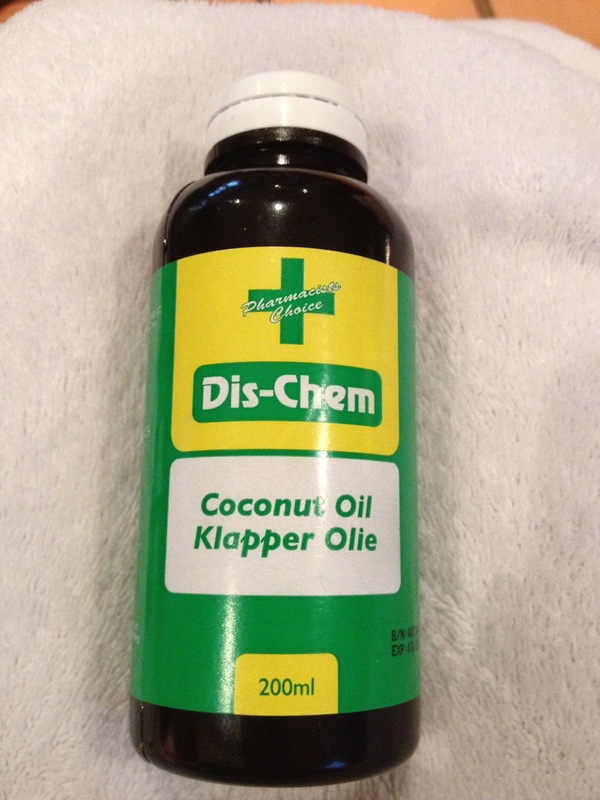 Luckily I bought the Dischem range – R28 for 200ml. Much better. Coconut oil works well for reconditioning dry hair, damaged hair and heat damaged hair. The molecular structure of coconut oil, unlike other oils or moisturizers that just sit on the hair, actually penetrates the hair shaft, getting past the cuticle, repairing and preventing damage from the inside out. Coconut oil is also anti-fungal in nature, making it a perfect natural anti-dandruff treatment or as a preventative treatment for dandruff. People that regularly use a coconut oil treatment report increased body and shine with less breakage, static, tangles, and split ends. Many also claim that hair sheds less and feels thicker after regular use. Coconut oil is well-known for its skin care benefits. It helps protect your skin from the aging effects of free radicals, and can help improve the appearance of skin with its anti-aging benefits. I popped the bottle in hot water because it’s compressed. That melted it a little bit and I squeezed out the harder parts that hadn’t melted. They melted quickly though when I rubbed my hands together. You don’t actually need much because it goes quite far when applied. Anyway…I was quite surprised that after a few minutes of application I didn’t have any major oily residue on my skin.